... Because of Board's indifference Kumasi Asante Kotoko Football Club might lose ¢300 million plus if the new Board of Directors continue to be adamant to a request by the former IMC for the endorsement of arrangements it put in place to generate revenue for the club. The position of the Board on the issue at stake is coming at a time salaries of players for the first are paid two weeks into the next month. The Chronicle has gathered that salaries for players for the month of February were unusually paid on March 12, 2004. As part of efforts to diversify revenue sources of the club, the IMC secured a guarantee from a philanthropist for the production of 130,000 calendars two of different types for sale to the general public. The consignment of two batches have since January this year been delivered but three months into the year the calendars currently stocked in a warehouse can only pass as white elephants. The cost involved in the production is estimated at about ¢404,750,000 and all the P.V.Obeng led Board has to do is to endorse a request for advertisements to be placed in respect of the calendars to promote their sale. 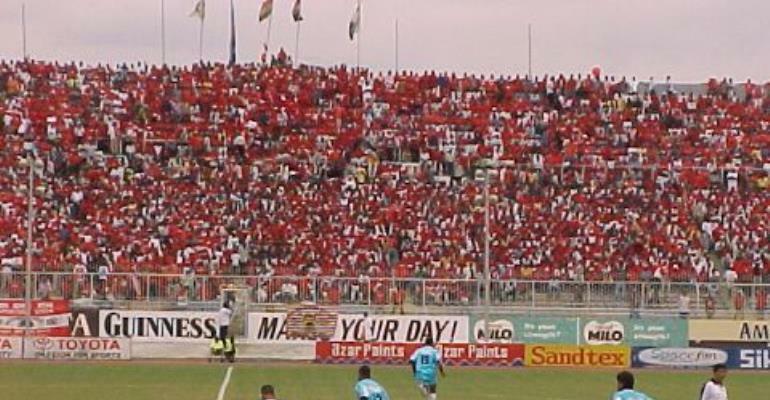 Once this is done, Kotoko (not the IMC) stands to profit by a cool ¢350,250,000 less the cost of adverts pegged at about ¢45 million. The Chronicle is informed that the Board has duly been informed about the transaction and that invoices and other documents covering the transaction have been handed over to Mr. Kesse, a Board member to enable the Board conduct some due diligence if it (Board) deemed it necessary. All other relevant information regarding the calculations, pricing and cost of production and charges was also brought to the notice of the Board per hand over notes by the IMC to the Board. At the time of filing this report the Board had not acted upon the request the subject matter of which was executed with the best of intentions by the IMC to generate revenue for Kotoko. The Board has reportedly also remained silent in a matter in which private individuals are cashing in on the sale of recording of the Kotoko-RTU match for which material Kotoko spent ¢12 million through Paul Adom Otchere to get TV 3 to produce. The IMC complains that it is unable to contact Paul Adom Otchere to produce the master tape of the recording yet copies of this tape are being sold on the market and even abroad at the expense of income-generation for Kotoko. Meanwhile, IMC chairman Mr. Sylvester Owusu Asare has confirmed the mentioned initiatives and appealed to the Board to investigate into who is behind the sale of the videotapes.